Silva Screen Records has started RECORD STORE DAY 2013 early by releasing a series of 5 Gerry Anderson soundtrack EPs with fabulous original music by Barry Gray. The 7″s will be released regularly from now until Record Store Day and collectors will be able to send off for a special stand to keep the set in. The recordings have been carefully restored and edited from Barry Gray’s own archives courtesy of The Barry Gray Estate and ITV Global Entertainment. 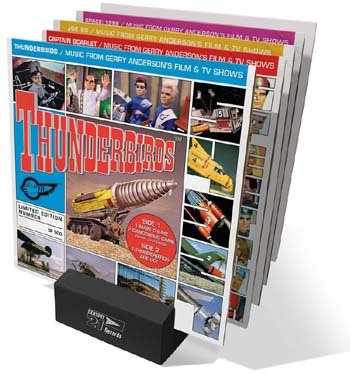 The series kicked off with the Thunderbirds EP, to be followed by Captain Scarlet, Joe 90, Space 1999… and finally, on RECORD STORE DAY the fifth and final element – a special (as yet SECRET!!) Flexi/Disc Poster package to be available only on RECORD STORE DAY 2013. Each is a COLOURED VINYL, NUMBERED, LIMITED edition of 700 copies. 200 of these will be kept and sold as a complete set in MAY 2013, this will be at a premium price so collecting them as they are released is the way to go! !